German publishing house MarcoPolo has decided to create new type of travel book, which is more like a coffee table book than anything tourist will carry in the backpack or in packet. 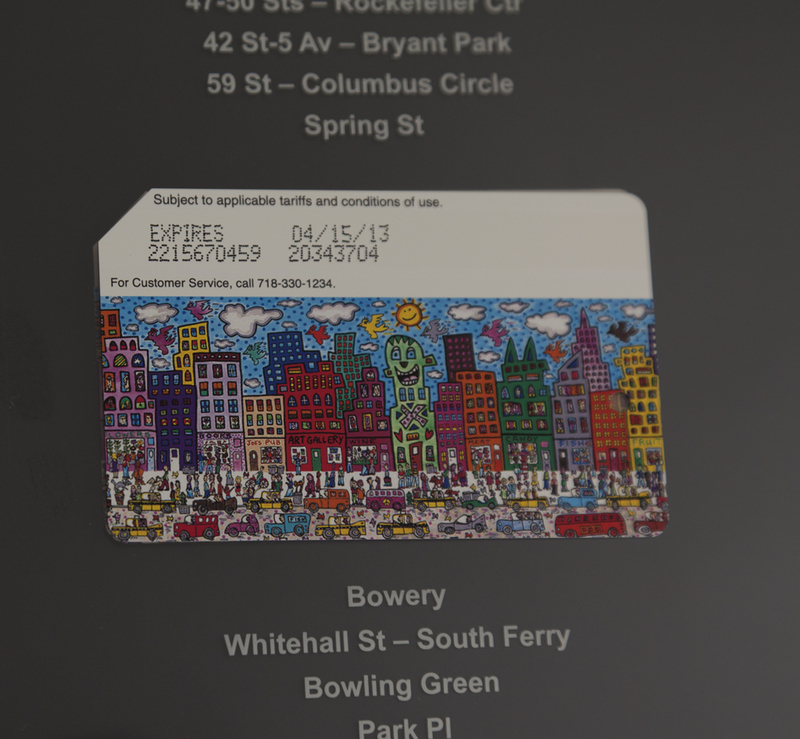 They collaborated with artist James Rizzi who once was already featured with his work on metrocard issued by MTA in 1994. 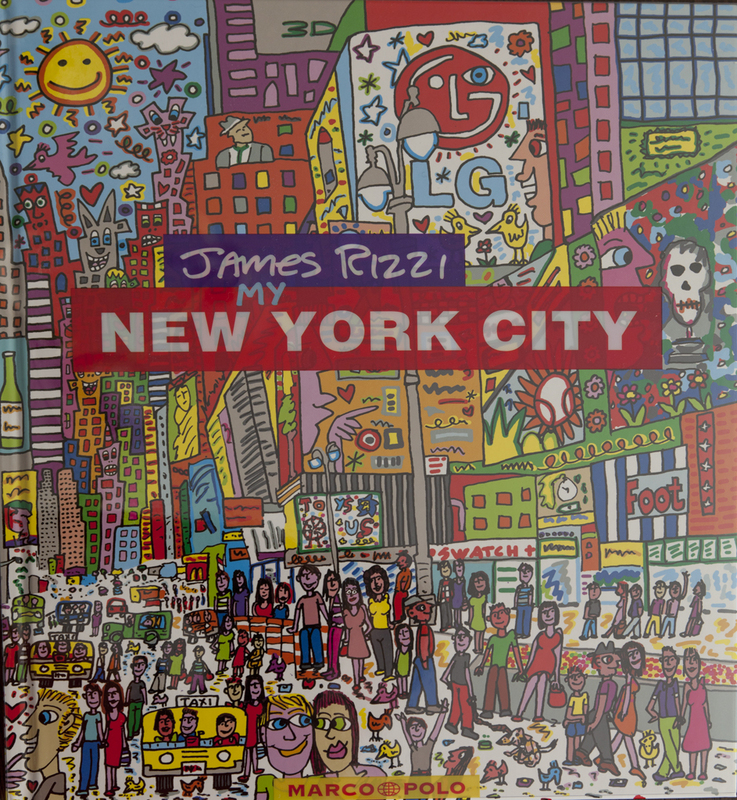 The book itself is wonderful piece of work. 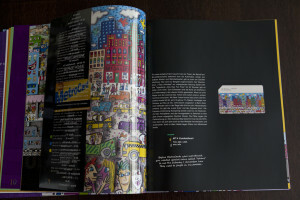 The first edition has circulation of 3,000. 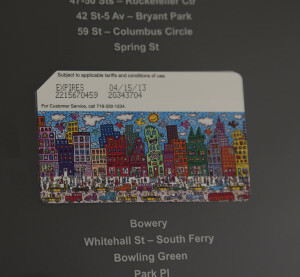 It contains real MTA metrocard which can be taken off the book and loaded with money to use in transit in NYC. 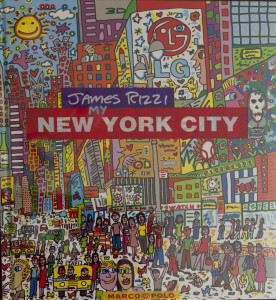 Book has 2 coupon to buy some Rizzi’s related stuff on amazon.de, 2 CDs, baggage tags with Rizzi’s drawings, post cards and card with his autograph. 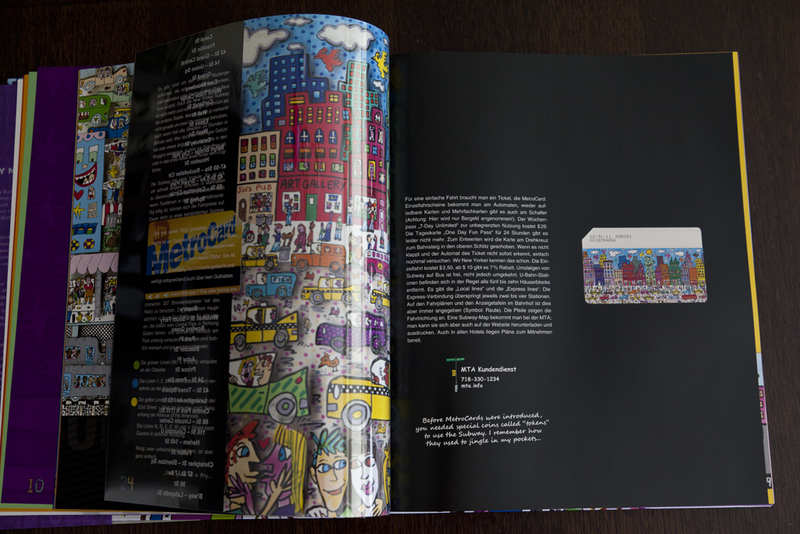 I highly suggest to all collectors to buy the book rather than go to Ebay and buy cards ripped off. 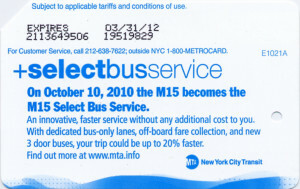 In November 2011 MTA introduced ‘Select Bus Service’ on routes M34 and M16 in Manhattan. It allows customers to pay for the ride on the bus stop rather than in the bus itself which suppose to speed up boarding of passengers. There are plans to do the same in other boroughs as well. The first one was in the Bronx for route Bx12. 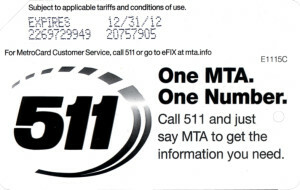 511. 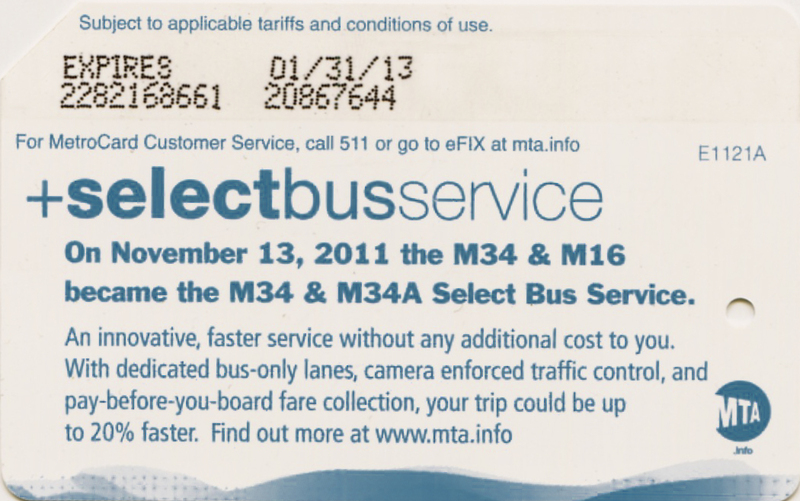 One MTA. One Number. 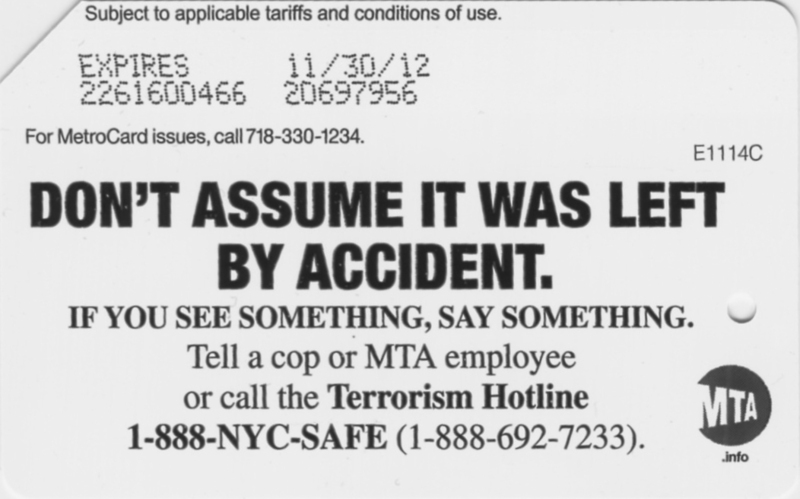 As MTA advertised they wanted to cut down to just one number customers can call to get any kind of assistance. 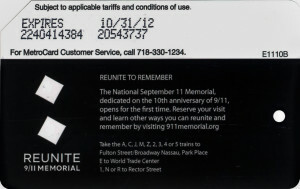 This is similar to New York city number 311. And it is 511. It is second times MTA makes metrocard to promote usage of this number (the first one came out almost exactly one year ago). 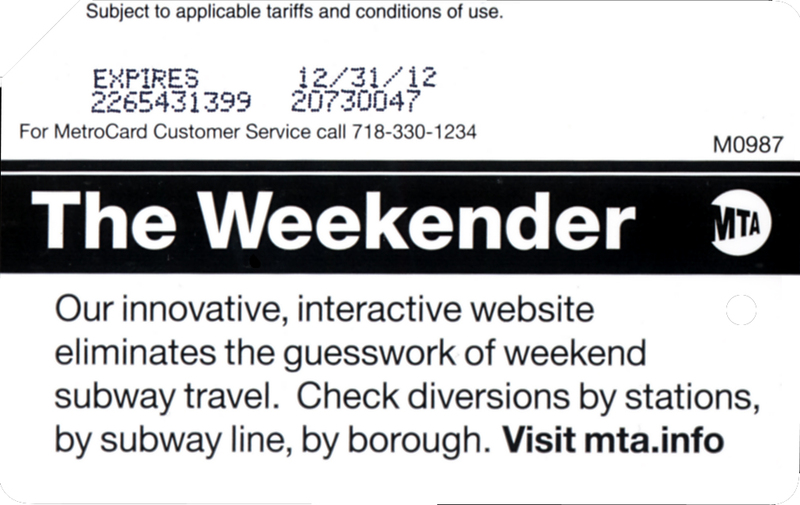 MTA has new splash page when anyone access mta.info starting on Friday till Sunday (does not exist any more). 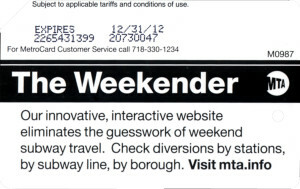 It calls Weekender. 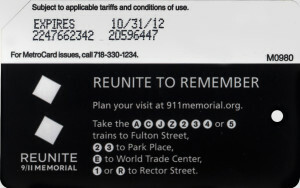 This metrocard promotes usage of MTA website (mta.info). Anyone can see also link to that page on regular home page in breadcrumbs on right upper corner. 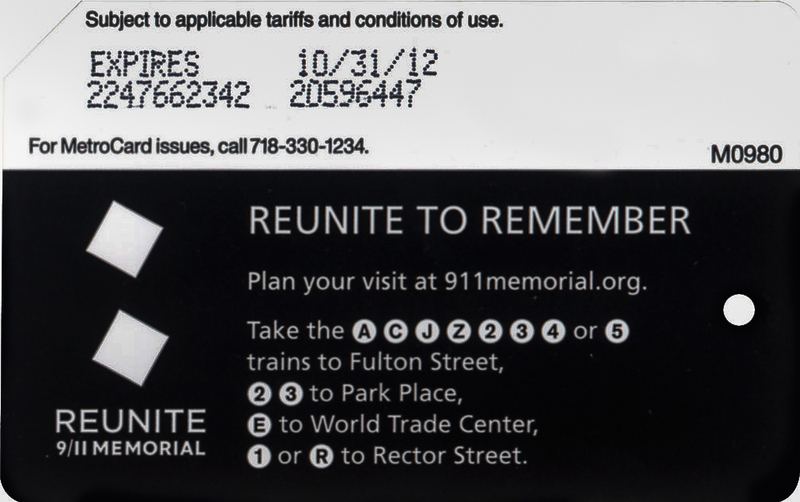 MTA commemorates 10th anniversary of 9/11 tragedy with 2 metrocards. 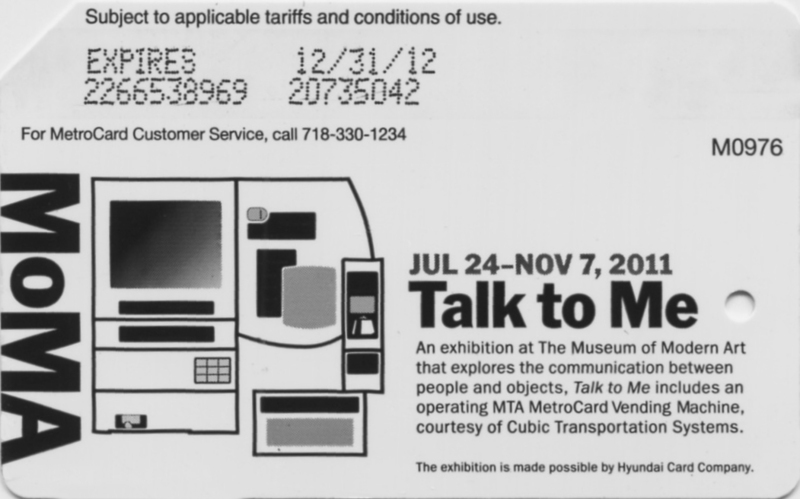 “Talk to me” a new exhibition at Museum of Modern Art in New York. 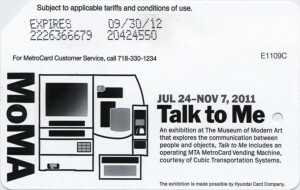 Cubic transportation installed MVM in that exhibition. 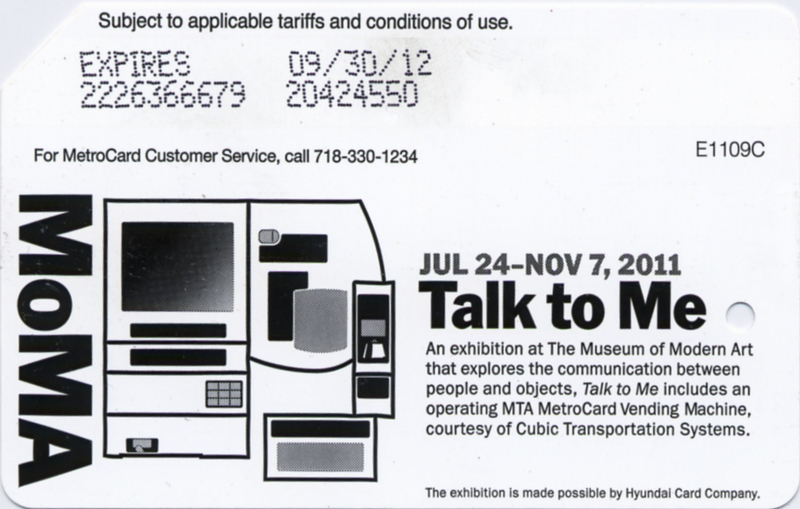 Exhibition is sponsored by Hyundai Card Company (another credit card company). There are 2 versions one pure white and another off-white background. 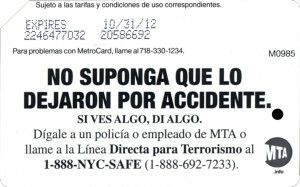 New metrocard with a message If you see a suspicious package call MTA employee or police officer in English and Spanish have been issued by MTA. 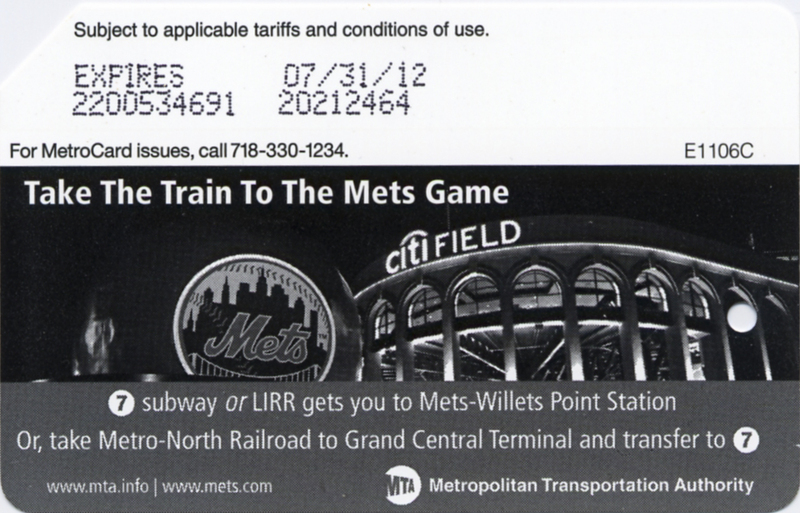 This is 5th metrocard with the same theme issued by MTA. 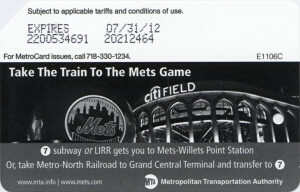 This card features new Citi Field stadium. 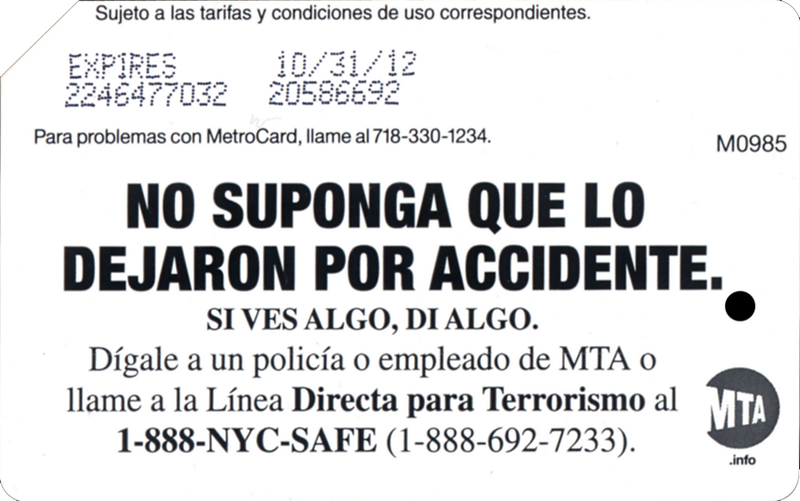 Also new phone number is printed on the card. 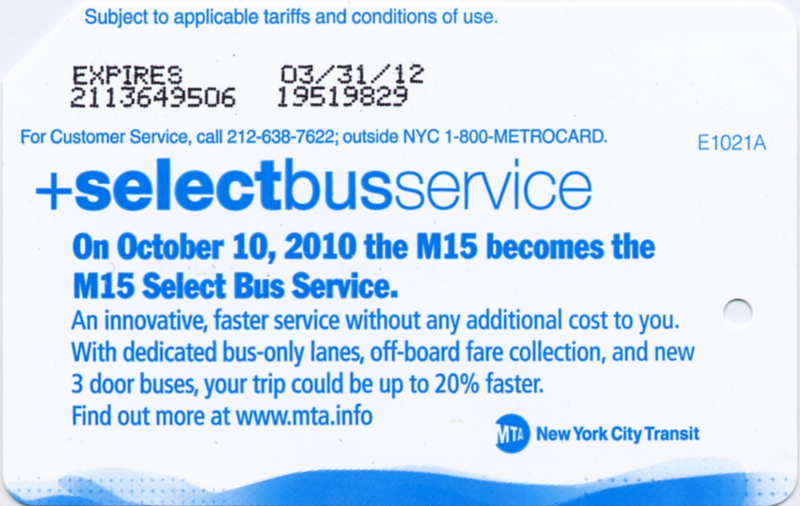 In October 2010 MTA introduced ‘Select Bus Service’ on route M15 in Manhattan. It allows customers to pay for the ride on the bus stop rather than in the bus itself which suppose to speed up boarding of passengers. There are plans to do the same in other boroughs as well. 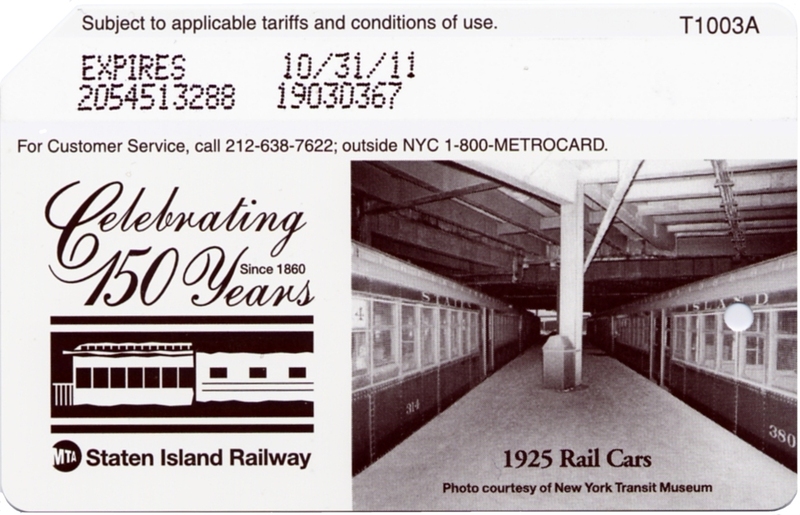 The first one was in the Bronx for route Bx12. 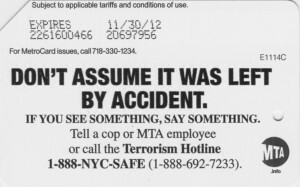 MTA also issued matching leaflet. 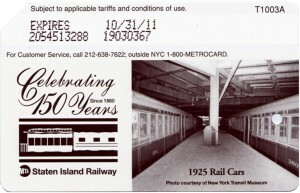 Metrocard featuring image of Staten Island Railway station at St. George at ferry landing from 1925 to celebrate 150 years since SI railway started to operate. 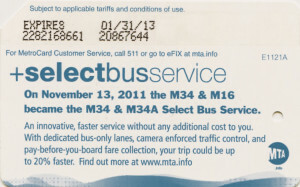 MTA printed also matching leaflet. All money you donate will go towards maintaining this site.